The First Annual Caring for Kids Holiday Gift Drive! 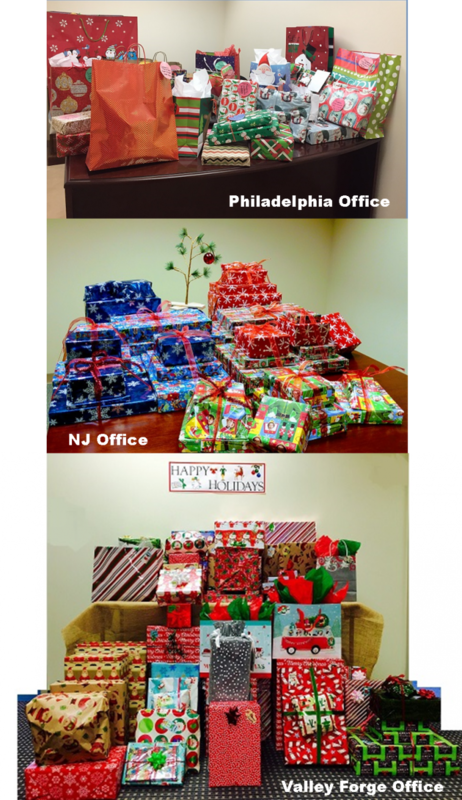 The Chartwell Law Offices, LLP, a full service law firm headquartered in Eagleville, (Valley Forge), Pennsylvania, which has offices in eight states including: Connecticut; Florida; New Jersey; New York; Pennsylvania; Rhode Island; and Tennessee is giving back locally this holiday season with the introduction of the first annual “Caring for Kids Holiday Gift Drive”. As an advocate for developing strong and meaningful community relations, Chartwell is thrilled to announce its new holiday outreach program. Developed by Chartwell’s offices located in New Jersey, Philadelphia, and Valley Forge, the holiday gift-giving project was done in conjunction with Saint Malachy School in North Philadelphia. According to Saint Malachy’s mission statement, the time-honored school is “Committed to sharing gifts and resources through works of charity and service, acts of peace and justice, and respect for the earth and all creatures, with special care for children and all those in need”. Suiting their actions to their words, Saint Malachy School is a tuition-assisted school, with families receiving scholarships based on need. For some families living in the North Philadelphia neighborhood surrounding the school, the holiday season is a time of great need. However, this season, the Chartwell Law Offices is hoping to ease some of that need by providing holiday meals and gifts for some of the area’s less fortunate families. Working closely with Saint Malachy School, Chartwell is bringing “Holiday Cheer” to ten local families, delivering a delicious dinner to each and distributing numerous bags full of shiny wrapped presents for the families’ children. In so doing, Chartwell hopes to brighten the lives of each and every family member they have been able to assist, creating a joyous and memorable holiday season.